I was inspired by a conversation I had earlier this week. Actually I was inspired by many conversations this week. A really great week all around. One of the great conversations was about the size of the St. John's NL business marketplace as it is associated with what is within reach by a single hop flight. Well... I consider the St. John's population to be over 40 million and includes two of the largest business cities on the planet (London & New York). So when looking at the direct flights available from St. John's and consider the cumulative population of these cities [ London (12.6 million), New York (19.1 million), Toronto (6.4 million), Montreal (3.8 million) ] and their collective global financial influence, the market for St. John's is massive and with solid financial footings. 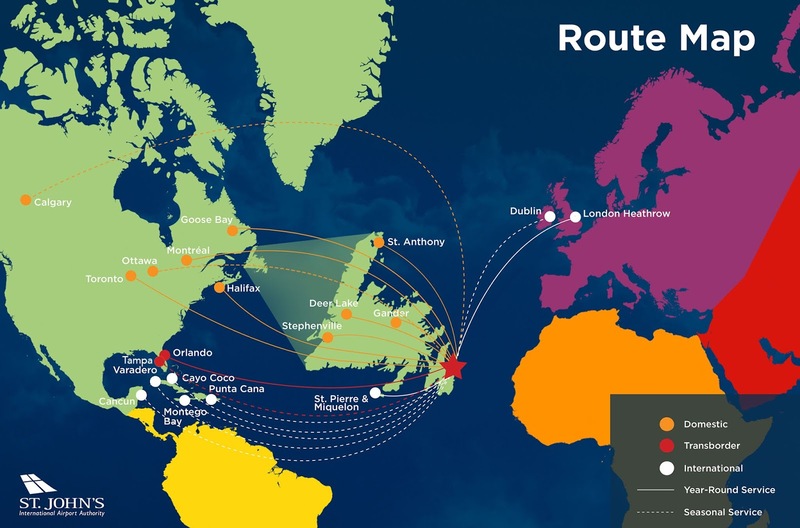 If you are growing a business or thinking about starting a business in St. John's (or any city within single hop flight of your own city) the market is a lot bigger than you think. So maybe shift how you perceive your market, reach out across your cities direct flights, consider what is at the other end, and book some flights. Use the global communications network to your advantage, visit each of these cities on a regular basis, budget for it in your business planning. Given the St. John's mid-Atlantic location, the future is indeed bright!